Stunning landscapes and spectacular views make a fall-foliage road trip through the American South something worth adding to your bucket list. Every autumn along the stretch from Asheville, North Carolina, to Virginia’s Shenandoah National Park, leaves transform from lush, vibrant greens to rich, shocking shades of scarlet, gold, and amber, and the south’s scenic drives become a cavalcade of jaw-dropping vistas. As temperatures cool, the crisp, clean air begs for long, deep breaths. In other words, there is no place like the South when summer changes to fall. Typically, prime leaf-peeping begins in late September at the highest elevations and gradually progresses to lower elevations in October and early November. Much of this depends on the weather, temperatures, and precipitation. In fact, the Weather Channel has a fall foliage index to keep you abreast of peak viewing times and locations. 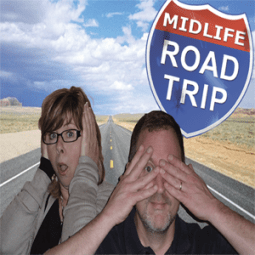 Here are some of my favorite road trips for seeing the show. As part of the U.S. National Park Service, the Blue Ridge Parkway, near Asheville, is a 469-mile stretch of non-stop leaf-peeping beauty with breathtaking scenery, kaleidoscopic color, and dozens of hiking trails. There are plenty of scenic outlooks and perfectly placed picnic spots along the way, so be sure to fill your lunch basket before getting on the road. Make your first stop the Blue Ridge Parkway Visitor Center in Asheville; here you can pick up maps and information about everything from farm stands and corn mazes to traditional artisans along your route. While you’re at the Center, be sure to check out the hands-on I-Wall, a 22-foot interactive map that gives multimedia information on places to visit on and near the Parkway. Viewfinder Tip: For updates on prime times and locations for fall color viewing call the U.S. Forest Service Hotline at 800-354-4595. Just 75 miles from Washington, D.C., in the Blue Ridge Mountains of Virginia, sit 197,000 magnificent acres of mountains, forest, waterfalls, and scenic overlooks otherwise known as Shenandoah National Park. This is the place to get off the beaten path and enjoy nature. 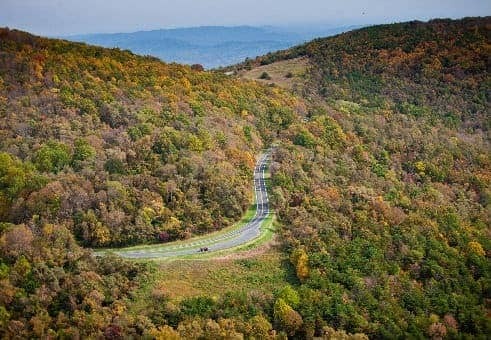 There are more than 500 miles of hiking trails (with connections to the Appalachian Trail), as well as 236 miles of winding roads, including 105 miles of Skyline Drive, one of the country’s most scenic drives. Don’t forget your camera. And while the colors of the leaves likely will take center stage, keep your eyes open for wildlife. This area is home to an abundance of living creatures including black bears, raccoons, fox, deer, owls, coyotes, and wild turkeys. Park the car and hop aboard the Blue Ridge Scenic Railway in Blue Ridge, Georgia. The ride begins at the circa-1905 depot and chugs its way into the Chattahoochee National Forest along the Toccoa River. The 26-mile round trip excursion takes 4.5 hours as it meanders through trees with resplendent colors. It also includes a 2-hour layover in the twin mountain towns of McCaysville and Copperhill, where you’ll find antique and specialty shops, art galleries, and eateries. October is peak season and seats are at a premium, so be sure to make reservations in advance. The Newfound Gap Road starts in the charming mountain town of Gatlinburg, Tennessee. Cresting at 5,000 feet, the road descends into Cherokee, North Carolina, a mere 30 miles later, but not before you get to experience a condensed version of everything that Great Smoky Mountains National Park has to offer. Driving over the Newfound Gap Road has been compared to driving from Georgia to Maine because of the variety of forest ecosystems you experience. The drive takes about an hour, depending on traffic and how many times you stop along the way to take pictures of colorful leaves. Along the journey, make sure you stop at the Clingman’s Dome observation tower. It has 360-degree panoramic views and on a clear day you can see leaves changing colors for 100 miles. Clingman’s Dome is the highest mountain in the Smokies, and the highest point in the state of Tennessee. Also known as South Carolina Highway 11, the Cherokee Foothills National Scenic Byway is nearly 120 miles long and stretches from the Georgia line to Gaffney, just below the North Carolina line. This two-lane road, originally used by the Cherokee Indians and English and French fur traders, rambles along the South Carolina high country past orchards, parks, lakes, rivers, waterfalls, farm stands, and quaint villages. When you tire of marveling at the foliage, get a bite to eat at the Bantam Chef, a unique family owned, 50s-style diner in the small town of Chesnee. The place still serves cups of coffee for 25 cents apiece. (Chefs there also make biscuits and gravy from scratch.) Elsewhere along the drive, stretch your legs at Cowpens National Battlefield, a revolutionary war battle site. Stroll the 1.25-mile self-guided battlefield trail, which includes wayside exhibits, the 1856 Washington Light Infantry Monument, and the Green River Road, which both armies used to get to the Cow Pens. All told, the walk will take you about a half-hour to complete. Where is your favorite place to view autumn’s change of colors?